Developers can customize or add devices to the Device Database at any time. Though µVision contains many pre-configured standard products, adaptations are needed if the device is not listed. Open the dialog with the menu File - Device Database. Double-click a microcontroller similar to the device needed in the application. Adapt the name of the chip vendor. Select the appropriate microcontroller family. Enter the part number for the device. Modify the description to match the device characteristics. Add or modify the toolchain configuration parameters in the field Options. Refer to C. Device Database Parameters for more information. Single-click into the field Data base. This enables the button Add. Click Add to create a new entry in the Device Database. Remove an entry from the Device Database with the dialog File - Device Database. Find and click the device in the field Data base. Click Remove, or press the key Delete. No warning is issued when deleting an entry. The device is deleted immediately. Select and use a generic device until the required device is added to µVision. Later, you can switch to that device at any time during the project life cycle. For MDK Version 5, the device list is created from the information in the Device Family Packs (DFP). If a device is missing, either download a DFP from www.keil.com/pack or create a DFP as explained in Application Note 254: Adding Support for New Devices in MDK Version 5. Open the dialog Project - Options for Target - Device. Scroll to the section ARM or Generic and select the device. Specify the chip characteristics in the dialog Project - Options for Target — Target. 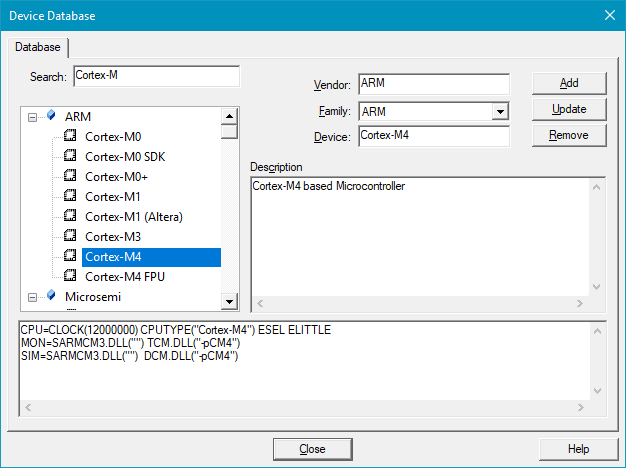 ARM cores - support for ARM7, ARM9, Cortex-M, and Cortex-R microcontrollers.